Thank you for all your messages, emails, texts, and comments about your thoughts and prayers for my family and friends in Japan. So far, everyone we have contacted is safe and were finally able to find out that one of our family friends in Sendai survived. Most of them have property damage but they are all thankful that their lives were all unharmed. My paternal Aunt, was working on the 9th floor in Tokyo when the earthquake hit. She said it was the scariest earthquake she's ever felt with the building swaying back and forth and office supplies shaking/falling. She walked home since the trains were not working and biked back to work the next day. I don't know if I'd have the courage to go back to work after experiencing an earthquake of that magnitude. I can't help but cry every time I see the images and interviews of the survivors. It's so devastating. I continue to send my thoughts and prayers to everyone in Japan. I know I'm a little late in my Daily Dose of Bruce updates but a lot has been going on around here and the poopy internet connection at my dad's house doesn't help. Brandon just told me he's been refreshing my blog for new photos with no luck. 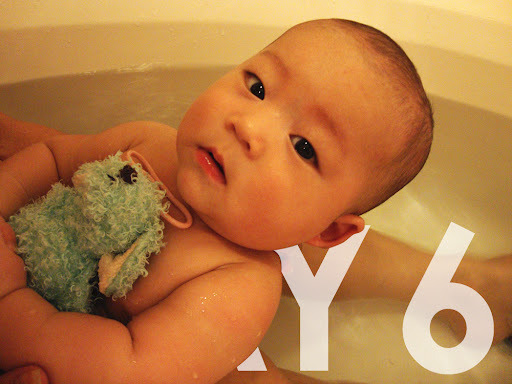 :( We're Skyping right now and it's been a couple days since the last time we "saw" each other. Two thumbs down for Cox Cable Company and the router. 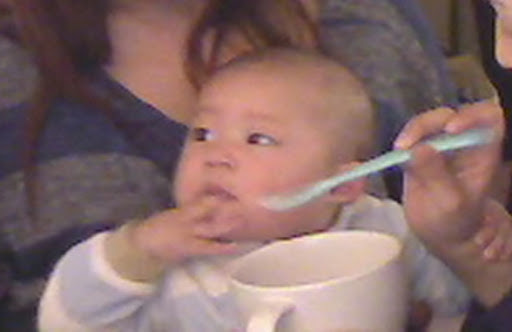 Brucie had his first rice cereal meal and Brandon took this picture below via our Skype date. He ate all of it and a couple hours later, he took a bath with his grandma (picture above). At midnight we all wished my mom a happy birthday!